Before I tell you anything about this chicken, let me lay it on the line: this chicken cost $6. (That's in Ardmore, PA. Prices vary from store to store). That might not seem that bad to you...and it's really not terrible, but if you consider you can get a decent chicken dish at a "Chotchkie's" type restaurant for eight or nine bucks, then this Serenada better change your life. When you buy frozen chicken at Trader Joe's, not only are you not getting side-dishes and service and a cute waitress with 15+ pieces of flair, but you have to heat it and prepare it yourself. Ahem, back to the Trader Joe's Chicken Serenada. Most bites were delicious. But some were better than others. The majority of the dish was nice, juicy white breast meat. A few bites were a bit stringy, and there were traces of skin. Some people, like my wife, are fans of chicken skin, and it doesn't bother them to get a bit mixed in with their meat. I'm not one of those people. Animal skin of any kind revolts me. It's not just the principle of the thing, it's the texture. Skin is so elastic...it's too chewy. But anyway, the bites with skin were just aberrations in an otherwise terrifically-textured plate of poultry. Flavor-wise, the chicken itself tasted great, and the sauce was excellent. I'm not sure what all was in the sauce, but there appeared to be several different kinds and colors of peppers and onions. On about the third bite I took, there was this very magical moment in which my mouth became unusually, uncommonly, and abnormally happy. Way happier than usual. Not that it's usually unhappy...but there was just something about that particular bite. The experience repeated itself at least three more times throughout my consumption of the chicken. I tried to slow down and be aware of what I was shoveling into my mouth, so that I could pick out what was causing these sporadic occasions of noshing nirvana. I never did figure out what it was. My best guess is those green pepper-looking vegetables. Anyway, that handful of magical bites was as close as I came to having this chicken change my life forever. But alas, it was too infrequent and irregular to call this chicken transcendent. Also, I should mention that the serving size was just barely enough for one person. Sonia and I shared it so we could both taste it and give it a score. Sonia liked it. She doesn't know where the dish came from. She says it's not Mexican, so we're guessing it's some kind of Spanish meal. 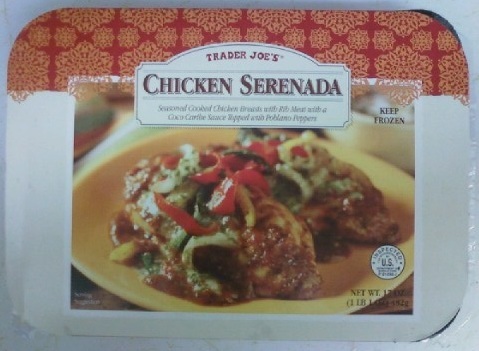 "Chicken Serenada." It's like having a ballad written for you by a baked yardbird. I picture farm fowl dancing flamenco and clapping their wings together in unison. It's beautiful. But not to the point that I can overlook the stringy bites, the stunted serving size and the hefty price tag. I'll give it a 3.5. Sonia gives it a 4 for it's pleasant taste and texture. Not bad for a gourmet entree you can heat in the microwave. The chains are horrid. We had a TGIFriday's that finally closed, thank goodness because it was disgusting. "The Nazis had flair, they made the Jews wear it..." love that movie. Haven't seen this at my Trader Joe's...I'll keep an eye out for it. Haha Janelle! Great quote...Well, Michael and Natalie...I'm pretty sure the whole story would gross everyone out. Let's just say we got really sick afterwards and we're pretty sure we ingested at least one bodily fluid. Never again, Applebee's! Never again! Mmm, Chicken Asada will be on our list of stuff to try. Pineapple juice? That might be really good, actually. Russ, we will tell you the story next time we see you. Fun stuff! Once my husband and I ate at Chili's and I found a bug in my salad. The manager came out and chuckled and said that no matter how many times they washed those greens sometimes one of those little suckers still made it through, ha-ha-ha. Then she offered me another salad...as if I wanted one. Blech.